You should make a habit of checking your oil once a month. Image from Flickr. There are times we all wish that our cars would just go — no maintenance, no oil changes, no worries. If you own or lease a vehicle, though, you need to keep an eye on vehicle maintenance. The good news is, if you keep up on your maintenance, you can save time and money. Keeping your car in good shape doesn’t have to mean a full weekend – or even a full hour. Keep an eye on these things every 30, 90 and 180 days, and you’ll have warning of anything that might be going wrong. While you’re fueling up your car – or even just on a certain day each month – check a few things to make sure that your car is in good running order. These once-a-month vehicle maintenance items take about as long as it takes to fill your tank. 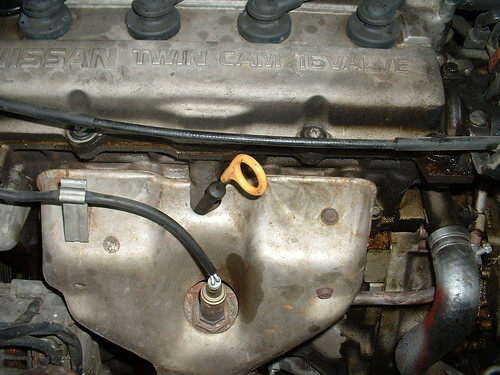 First, check the oil and add more if you engine needs it. Take a look at your tires, make sure they have tread, aren’t wearing unevenly or bulging, and they have proper pressure. Take a look at the hoses, belts and air filter, and replace them if they’re dirty, cracked or rotting. Every three months, you should take your car in for an oil change, if you’re driving the car regularly. This is a basic tenant of vehicle maintenance, and if you do have a shop that changes your oil, you’re in luck. A standard oil change at a quick-change place or vehicle maintenance shop usually includes checks on all 90-day items. If you change your own oil, you should be sure to check the windshield wipers, wiper fluid, battery, brake fluid, transmission fluid and steering fluid. Every six months or so, you should give your vehicle a full maintenance once-over. If you take it into a shop, ask for a check-over and tuneup. If you’re doing it on your own, include everything in the normal 30 and 90 day check items, as well as a few more. Check the brakes, the exhaust system, the shocks, struts and all the lights. You should also make sure your horn works. Of course, keeping tabs on your vehicle maintenance does not assure that your car won’t have problems. It does, however, make it easier for you to spread maintenance costs out over a period of time, and it will keep your miles per gallon at optimum level. It takes no more than an hour a month, and it’s definitely worth it.